File photo: Sudan’s President Omar al-Bashir delivers a speech at the Presidential Palace in Khartoum, Sudan February 22, 2019. Sudan’s military has carried out a coup against President Omar al-Bashir following months of demonstrations. Protest leaders said they would only accept a civilian administration. The Sudanese military on Thursday removed longtime President Omar al-Bashir in a coup following months of popular protests against his three decades of iron-fisted rule. The army deployed at strategic points around the capital Khartoum and the international airport was closed, as tens of thousands of protesters gathered at the Defense Ministry celebrating the fall of al-Bashir. Defense Minister Ahmed Awad Ibn Auf in a televised address said the army had arrested al-Bashir as he announced the dissolution of the regime. “I announce as minister of defence the toppling of the regime and detaining its chief in a secure place,” he said on state TV. The statement followed an intense morning after the military had taken control of state radio and television stations, leaving Sudanese awaiting for details in the wake of the coup. Ibn Auf, who doubles as first vice president, declared that the constitution had been cancelled and a military council would lead a two year transtional government until elections are held. State goverments, the parliament and the council of ministers were similarly dissolved. A state of emergency was also declared for three months and the country’s ports, borders and airports would be temporarily closed, he said. Since mid-December, Sudan has witnessed sustained protests sparked by a tripling of bread prices and an economic crisis that has led to a shortage of basic goods. The protest movement quickly morphed into a sustained challenge against al-Bashir’s rule. 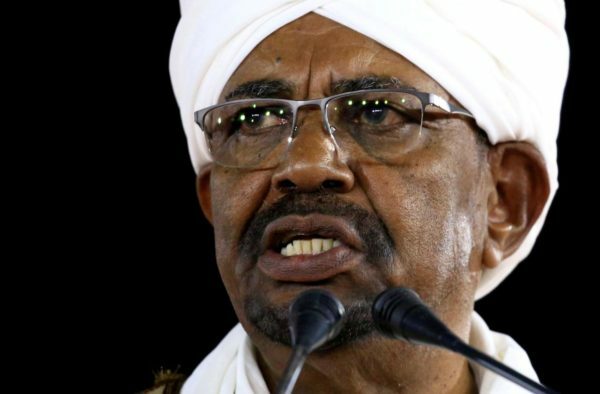 Read more: Sudan: Could army-backed protests topple Omar al-Bashir? 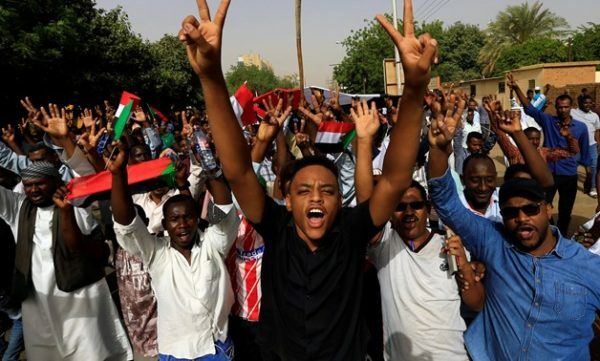 The protests have intensified since April 6 as thousands of demonstrators joined a sit-in outside army headquarters in Khartoum, which also houses al-Bashir’s residence, calling for the president to step down. At least 11 people including six security forces have been killed since the weekend in clashes. Protest-related violence has left at least 49 people dead since December, according to official numbers. The Sudanese Professionals Association (SPA), which launched the protests in December, had urged the army to take the side of the people and negotiate a political transition to end al-Bashir’s rule. In a sign the regime was fracturing, earlier this week soldiers protecting protesters clashed with the feared National Intelligence and Security Service (NISS) leading the crackdown. Police also ordered officers to avoid intervening against the demonstrators. Despite the immediate jubilation around al-Bashir’s downfall, the military intervention risks replacing one dictatorship with another, dashing protesters’ hopes for a civilian government and opening the way for instability. In an apparent bid to appease the protest movement, the security services said they would release all political detainees without explaining when they would be freed. The protests against al-Bashir gained a boost last week after Algeria’s ailing President Abdelaziz Bouteflika resigned in response to weeks of similar protests against his nearly 20-year rule. Earlier this week, the US, Britain and Norway called for Sudanese authorities to respond to protesters demands. “The Sudanese authorities must now respond and deliver a credible plan for this political transition,” the three countries said in a joint statement. Al-Bashir, an Islamist and former army officer, seized power in a coup in 1989. He had remained resistant to giving up power in the face of protests, saying that change can only come through elections. He had warned of chaos similar to the Arab Spring uprisings that led to civil wars in countries like Libya, Syria and Yemen. Al-Bashir is wanted by the International Criminal Court for war crimes and genocide committed during the conflict in Darfur.